For ten years now, in special partnership with the community of Musanze, Rwanda, Indiana University (IU) has created meaningful programs and connections across the country. It is an unlikely partnership, one that formed over 10 years ago with a university alum recognizing an opportunity for not only cultural literacy but friendship. It was 2005 and IU alumna Nancy Uslan was traveling in Rwanda when she noticed none of the school children in the local primary school had books. She came back to the states and turned to her alma mater to create a program that would not only provide high-quality books to students at the Kabwende Primary School, but would also provide a cultural exchange between U.S. elementary-school students and Rwandan students. 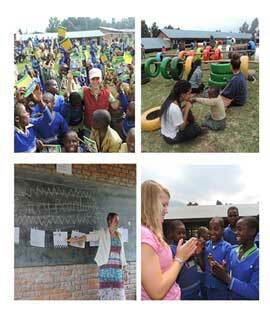 Fast forward 10 years later, and IU’s impact in Rwanda has grown exponentially. For the past 6 years, we have expanded the program in a variety of ways and this summer (Aug. 10-18, 2018), in efforts to commemorate our 10 years of service in Rwanda, we have invited a number of faculty and professionals who will each work on specific projects associated with the promotion of literacy and education. We still provide books — 20,000 total this year — but we have grown to include teacher training; a three-week, literacy-focused camp for students; the school’s first library and three playgrounds. And we’re not done. This year, we are providing eye exams and glasses for hundreds of students. We will also be providing 3-D prosthetic hands to four young people in the area, along with partnering with a local high school to teach 3-D printing and bring those vocational skills to the community to create tools needed in construction, that are hard to find locally in Rwanda. In essence, this holistic approach has helped us to look “beyond” as the program continues to grow and find new ways to share and partner with communities in Rwanda. 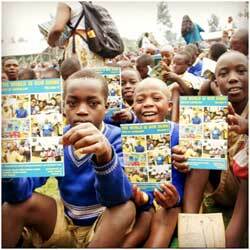 We remain committed to create, grow, and further educational opportunities for children in both Rwanda and America. I am extremely proud of the work IU is doing in Rwanda and the commitment and enthusiasm our students and faculty have for making a difference both at home and abroad. In celebrating ten years of successful engagement between our two nations, we have created lasting partnerships and friendships that will last a lifetime to come.